The Monastery of Our Lady of Hyning was founded in 1974 by four sisters from our communities at Slough and Westcliff-on-Sea, Essex. Until 1973, the house and garden was the home of the Peel family; a splendid country mansion situated in acres of farmland. This main house now serves as our guesthouse. When the sisters arrived they used the servant quarters and the guests would use the main house. In 1983, an extension was built to link a large outbuilding to the main house. This is now the Community area. A year later, a large barn was converted into a simple and prayerful Chapel with the cloister corridor built to link it with the main house. This a video about our life as Bernardines. We have tried to show different aspects of our life, our prayer and our Order. If you have any comments to make, visit the page on YouTube or Facebook or send us your comments. In 2016 we completed a completely new kitchen refurbishment. A series of interior works on boilers, rooms etc has also taken place. Prior to that, our last major building project was in 1999 when one wing of the house was gutted in order to install a lift and provide further accommodation and resources. 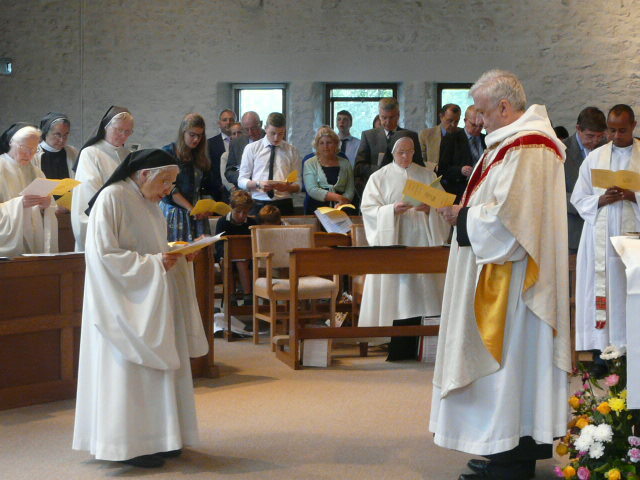 In 2006 our community at Slough was closed and several sisters from Hyning went to form a new community at Brownshill, Gloucestershire and several sisters from Slough came to join the remaining community. We are now 14 in community; 10 Sisters, 2 Young Professed. 1 Novice and 1 Postulant. Our new chaplain is FR. Anthony Keefe, a retired priest of this diocese. Image from March 2019 Sr. Stella and Sr. Mary Gabriel planting a tree from the Icon group given for the simple profession of Sr. Mary Gabriel in February 2019.